Football has accrued its fair share of sound-bites and foot-in-mouth moments. The poems in this anthology strike an altogether more subtle note and take us to the very heart of why a seemingly straightforward team sport arouses such passion and commands such lifelong devotion. 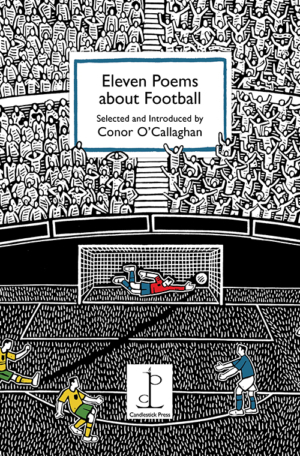 This mini-anthology demonstrates that the beautiful game is entirely worthy of the beautiful language of poetry. Poems by Simon Armitage, Tiffany Atkinson, Claire Crowther, Elaine Feeney, Miriam Gamble, Seamus Heaney, Gill Learner, Ian McMillan, Sean O’Brien, Conor O’Callaghan, George Szirtes and Sarah Wardle. Cover illustration by Hugh Ribbans. Boys will be boys and brothers will be brothers! An anthology that captures the hidden magic of the common-or-garden shed. Ten poems for cricketers and spectators young and old. The history and traditions of ‘the summer game’ celebrated in poetry. An anthology that captures the delight of owning and riding a bike.